Pulitzer Prize–winning journalist Humes offers a stirring story of how ecologically responsible practices are increasingly benefiting the bottom line, and how… the biggest retailer in the world is, slowly but surely, encouraging a change for the better. A fascinating, fair-minded look at the congruence between environmentalism and business, and the behemoth at the intersection. 2. 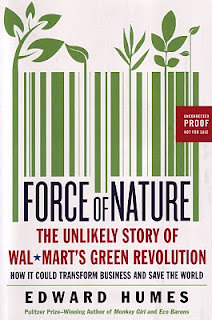 Kirkus Reviews, meanwhile, says Force of Nature is a "fascinating story of the evolution of corporate responsibility for the environment." 3. Some early book tour highlights: I'll be at the LA Times Book Festival April 30-May 1 (first time the fest will be at USC instead UCLA); at the ClimateOne discussion series at the Commonwealth Club in San Francisco on May 16, and at some great California independent book stores -- Kepler's in Menlo Park on May 12, Copperfield's in Sebastopol on May 14, and Vroman's in Pasadena on May 17. 4. Reader Reviews: Readers participating in Amazon.com's "Amazon Vine" book preview program have already posted several thoughtful and insightful advance reviews of Force of Nature. Check them out here. BTW, you can pre-order a copy via Kepler's, Copperfield's, Vroman's, Barnes & Noble, or Amazon.